The idea of doppelgängers has been explored before in film, but never in a fashion quite as twisted as Jordan Peele’s Us, a furiously entertaining horror show that gets weird, wild and so refreshingly unpredictable in a genre where the climate tends to flatline with endless Conjuring universe carbon copies and what have you. There’s a ton of ideas at play here and it makes the film hard to pin down as one thing or the other, but it works beautifully as a breathless, streamlined home invasion shocker with deeply unsettling undercurrents and implications that can be read many different ways. When Adelaide Wilson (Lupita Nyong’o) was a young girl, she had a terrifying encounter within a shadowy hall of mirrors on Santa Cruz beach, an encounter which will herald the arrival of feral versions of her, her husband (Winston Duke) and two children (Shahadi Wright Joseph and Evan Alex) as they vacation at their summer house a stone’s throw away from that very same beach. The prologue with her as a kid is set in the late 80’s and has a retro horror feel as Peele uses his favourite scary movies as both fuel and inspiration for the style on display here. The home invasion of these shadow selves is a brilliantly staged piece of white knuckle suspense and impressive physical acting, especially by Lupita as both shellshocked Adelaide and her other self Red, a growling fiend who is the only one of them that can talk. She rasps enigmatically about stuff that seems like both straightforward exposition and cryptic allegory, hinting at the secrets in store for the third act. Elizabeth Moss and Tim Heidecker are flat out hilarious as the Wilson’s bickering neighbours, bringing uproarious comic relief before confronting their own set of homicidal visitors. Lupita gives the strongest performance here in both her characters, a frantic dual role knockout that holds the film in panicky distress with her wide eyes and instills deep terror with what she does to her voice, she’s a consistently brilliant actress and I love her work in this. This is clearly a passion project for Peele, the imagination on display is something else and fresh new scripts like this are always welcome for me. Some may have issues with certain things in the third act like explanation and climactic resolution, but he deliberately leaves a lot of it for us to ruminate on instead of telling us every detail about what we just saw. There is a scene where Lupita’s Red imparts some of it but it’s still somehow told in a roundabout way and not laid open bare in spark-notes fashion. Some may find this frustrating, but I loved it. This is probably the best horror film I’ve seen since 2014’s It Follows, and definitely one of the most original. A shock inducing siege thriller, an acidic jab at personal identity and a quietly discomforting look at the rifts you can see beginning to form in the world today. Great stuff. 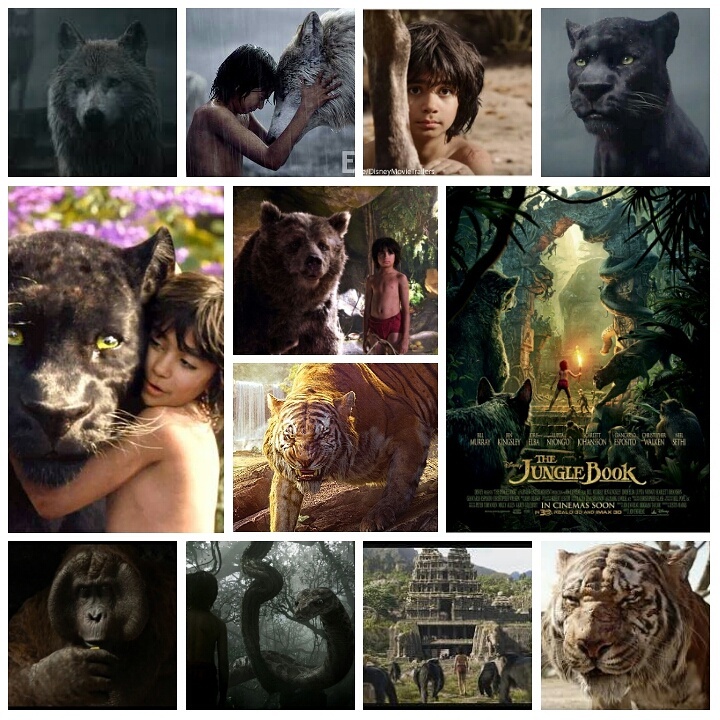 Prepare your eyes for maximum bogglement, work out your abs so you don’t bust a gut laughing, and most importantly, dust off that childlike sense of wonder before going to see Rudyard Kipling’s The Jungle Book, boldly and lovingly retold by Jon Favreau in what is the most flat out exciting, adventurous film of the year thus far. The director pulls off a balancing act between palpable tension, character interactions that come straight from the heart and land squarely in ours, and some of the most believable, jaw dropping CGI I have ever seen on screen. The animals look so impressive and lifelike that after seeing them I shelved away some of my inherent reservations about computer generated effects as a dominant force in a piece, and simply gave in. The atmosphere is lush, intoxicating and deeply detailed, with a naturalistic feel and tone. Young Neel Sethi is tasked with being the only fully human component, and is perfect. His interactions seem real and rehearsed, immersing the viewer further into the visuals. Mowgli is a young man cub, found on the edge of the jungle by the panther Bagheera (stately, compassionate Ben Kingsley) and given to a wolf pack to be raised by alpha Akela (Giancarlo Esposito) and Raksha (Lupita Nyong’o). Not all in the animal kingdom are receiving of this man cub, especially a terrifying Bengal tiger called Shere Khan, given the rumbling tones of Idris Elba, inspiring fear in animals and audience alike. He has a rocky relationship with man, and wants Mowgli dead. Bagheera takes him far into the jungle, where they are separated and Mowgli’s adventure truly begins. He wanders into the path of Kaa (a slithery Scarlett Johansson) a monstrous, seductive python, and is taken under the wing of Baloo, an adult Winnie the poo voiced by Bill Murray. Murray is one of the film’s great delights, and as soon as he shows up we forget about all the menace and threat which preceded his arrival, and are swept up into his affable, lounging lifestyle and brightly colored neck of the woods. Murray clearly ad libbed a lot of Baloo’s dialogue, and anything he didn’t he still gives that unmistakable, winking ‘Murray’ twinge that I so love. Mowgli’s adventure continues, as he stays one step ahead of Shere Khan and is visited by the king of the monkeys, a twenty foot tall, lumbering orangutan named Louie, voiced with demented, pithy glee by Christopher Walken. As soon as he showed up the laughs erupted from within me, and reached a manic peak as he belts out the ‘Oobie Doo’ song in priceless Walken fashion, his monkey mannerisms uncannily starting to resemble Walken’s own distinct visage. Many of the animals serve as differing parental figures to Mowgli, representing elemental factions of raising one’s young. Bagheera is cautious, doubting and skeptical. Baloo is the fun loving, lenient one. Even Shere Khan has a curdled paternal feel to him, like the brutal stepfather who is damaging to his offspring. Raksha is the unconditional mother, and that devotion comes out wonderfully in Nyong’o’s souful performance. The vocal performances are aided by the stunning effects; the CGI of facial features allow the actors work to truly extend into the realm of what’s visible, with real emotions displayed by the creatures, and not a single rendering that’s anything short of lifelike. The film evokes true wonder and primal excitement, escapism that takes itself seriously yet knows when and how to play, a dazzling technical marvel, a timeless story well told, all in one cinematic package that is not to be missed. Oh, and stick around for the credits, instead of Walken out of the theatre and missing a final musical treat.